"I love Braideez, especially for teaching young people to braid!" "My customers love it. (Braideez braiding wire) They tell me it's the easiest way to braid ever!" Laura Spittle- owner of Vermont Horse Country - S. Woodstock Vt. I own a lovely older warmblood, Harley, that I show in local dressage shows. Last year I tried out Braideez and I am not going back to yarn or elastic bands. The wire button braids were so easy to put in and a BREEZE to take out. The wire gave Harley's thin mane the body it needed to hold its shape when braided. They looked great and they stayed in for a two day show. The big plus is they come out without damaging a single hair! I highly recommend them. "This is the most innovating thing I saw at the AETA tradeshow!" Classic Saddlery AETA Trade Show Jan. 2011. 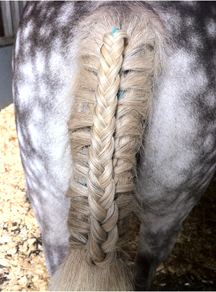 So, for the braiding-challenged among us, this actually works! I cannot braid to save my life - probably because I cannot pull my gelding's mane without him being drugged to the gills. I got Braideez over the weekend and quickly put one braid in to see if it worked, and it does! Below is a picture of my very first attempt with the braiding wire - not too shabby! So, thumbs up for this. Wasn't too expensive, either - $12.50 for a package of about 25 wires, reusuable. The Chronicle of the Horse blog. "I'll never band again. Braideez makes a bad mane look great!" "My customers love Braideez. One of them told me to throw away the yarn! A Hairdo for your horse: Braideez it’s the latest! So, I decided to try the wire on my miniature horse “Pepper”. I didn’t want to do show braids, I am just showing how much fun you can make use out of this product. Everyone likes to braid differently, and I figured I would give Pepper a sophisticated look for her tail, and then a Hippie-Chic look on her mane to give you different styling ideas. Braideez is really fun and easy to use. If you have kids in the barn and you would like to keep them busy, get a “party pack” in multi colors of Braideez and let them style away. The kids can have fun and the horses get a new hairdo for the day. Enjoy!